Techila Shots: [Off-Beat] Software Architect's Guide to Knocking-In a Cricket Bat! [Off-Beat] Software Architect's Guide to Knocking-In a Cricket Bat! So, Start of the Year 2016. Happy New Year to All Readers! I start off with an off-beat article on Knocking-In a Cricket Bat - Software Architect's Version. I have represented U-13 District, School, College, Club and Corporate as a Cricket Player. I am an Opening Batsman, Leg-Spinner and mostly a Mid-On/Mid-Off Fielder. But, I have been away from any 'representative/professional' form of cricket since 2003. In 2016, I have decided to get back to my old passion - at least to a certain measure. In that regard, I bought a new SG Kashmir Economy Cricket Kit and got an (exchanged) SG Kashmir Willow Cobra Gold Cricket Bat. So, I went through multiple YouTube Videos on Knocking-In (Primarily from English and US/Indian Cricket Merchants). Also, I read a few articles here and there on Knocking-In. Seeing that there are contrasting opinions on various aspects of Knocking-In, I have come up with my own version of Knocking-In. Hope it helps you as well. I will use the outcomes of this, for my next cricket bat (sometime later this year) - The current choice being SS Ton (Any) English Willow Cricket Bat. 1.Unpack your New Cricket Bat. Apply a Coat of the SS Bat Oil to every exposed part of the willow. You may use a soft tissue paper here to apply the oil. Something like the one given in restaurants or used as face wipe. Here, every exposed part of the willow (front, top and back) should be applied with at least 1 or 2 coats of oil. You can choose to apply length-wise; so that the oil spreads well and evenly. That too alternatively, first starting from top to bottom (on all sides) and then bottom to top. This is to make sure that nowhere the oil accumulates in a 'larger/uneven' quantity. 2. Leave the bat in a horizontal resting position with the face upright. You may also choose to keep this under 'sunlight'. The total rest period can be anywhere from 12-18 hours. 3. Now, apply another coat of Oil in the same way as (1) and then follow what you did in (2), this time you may choose to keep it for 18-24 hours. 4.Now Apply the Toe Guard. Apply lots of 'FeviBond' to the base edge of the bat. Also, apply lots of FeviBond to Toe Guard. You may leave it for 15 minutes. Preferred that you use an SG Toe Guard on a SG Bat (Seeing the Brand Name creates some 'Professionalism' and 'Motivation'). Now, apply one more coat of 'FeviBond' to each of the bottom edge of bat and the Toe Guard. Leave it for 2 minutes only - Then, press the Toe Guard against the bat edge so that it sticks together. Make sure that the centre of the Toe Guard is pressed against the edge. Now hit with the Bat Mallet so that the Toe Guard is put in place and bonds perfectly. Also, since there will be excess Toe Guard on both length and breadth - plaster it (bat tape or the useful anti-scuff tape) upwards to the edges and the face of the bat. This will make sure that the guard and the edge bond well together. Leave this overnight. In the morning, remove the plaster and you would find that the toe guard and the edge have bonded really well. Now use a sharp scissors to cut off the excess Toe Guard from all around the edge. [Now, you may use a sand paper - very mildly all across the edges, so that the edges of the Toe Guard and the Bat become uniform] At the end of this bat, you may be very satisfied with the look of your bat. Yay! Toe Guard. 6. Now, leaving the bottom Six Inches, Hit the Bat Mallet at 90 Degree right on the face of the bat. You should start off very softly so that you do not damage the bat. Hit every part of the face where a ball can hit. Once through with about 5 to 10 minutes, start by hitting harder at 90 Degrees. This should be the next 20 minutes [20 Minutes]. Leave your bat to rest, somewhere where the willow is exposed to direct sunlight. I did this to make sure all excess oil is dried. 9. Now, get ahead with your Bowling Companion. Preferably a medium pacer to throw or bowl with New Balls to you. Make sure you show the full face of the bat with shots in the V. This is atleast for the first net session. Come back home and use the bat mallet for 20-30 minutes in the same way, followed by ball mallet. Oil once more and rest willow horizontally with face up and facing the sunlight for 24 hours. 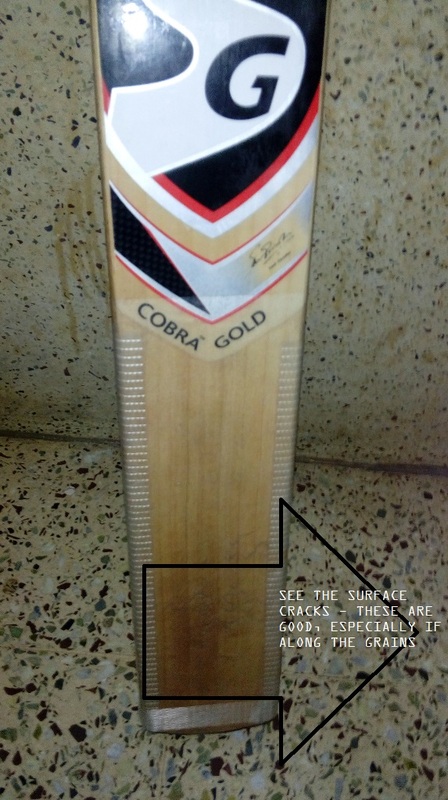 Now, apply Anti Scuff Tape on both the edges followed by a Bat Tape on the full face of the cricket bat. Yes, I also used the SG Bat Grip Cone to put an additional grip to my cricket bat. This is for better shock absorption and better control. Next time on wards, you may start off with a few horizontal bat shots with a cut or pull. After this, use it freely and you may also use it for a match. Note that when you hit with the bat mallet and ball mallet, hit as hard you can, progressively - because if you won't do it, the ball will still do it later and may even cause damage. Also, you will be able to identify the sweet-spot(s) of the bat during this time - Note them and re-affirm them. Also, you will notice the sound of the willow change as you progress through this process. Though some say that finger nails marks will not be processed once the willow is ready, I can only confirm that the intensity or marks of finger nails prints reduce to a good extent - but they still do appear. Also, Some say that the seam marks of the ball stop appearing as the willow gets seasoned - This I can confirm from my own experience. If deep finger nails are still appearing or seam marks are appearing on the cricket bat, then still your bat needs more work (more knocking-in). This is my finished SG Kashmir Willow Cobra Gold Cricket Bat. Okay, Now for the motivators for this start of cricket term from 2016. Enjoy! I will mention as comment to this post, all throughout, the scores that are note-worthy (30+) for organized friendly or representative matches, all scored from the bat seasoned using the above process! All the Best to You! Also, If you are in Bangalore and want to Join the concept or the team started by me - Bangalore Software Engineers XI, You are most welcome - http://www.meetup.com/bangalore_software_engineers_xi/ This is a Meetup Group with an eventual aim to be a Registered Society/Club/Organization in India and to participate in Club Cricket in Bangalore. We start off with weekend Net Practice Session, Friendly Matches (2-Day/T20/ODI) against other local Corporate or Club Team. The first preference is for folks who have already played earlier for any of State, Zone, District, University, School, College, Club or Corporate! this is sumith kumar puri again. i can verify that the bat oiled and knocked-in using this process has good stroke and sound all over - top, middle and bottom. there are almost next to none shocks or jitters. i whole heartedly recommend this process to knock-in the bat. this comment has been shared by almost 3+ other members of a new club that i have formed. oops... after usage by around 11 different batsmen for 3 net practice sessions and for a total of 6+ hours of batting - containing top, middle and lower order batsman - the bat broke, yes a ugly long vertical crack at the... rear side to the center of the toe! the analysis is unruly usage and also seems like there was very less oil (the crack makes me feel so) - i used to dry the bat a lot after oiling and also apply with a tissue paper. i am trying the same process with an english willow bat right now, i will keep you updated. 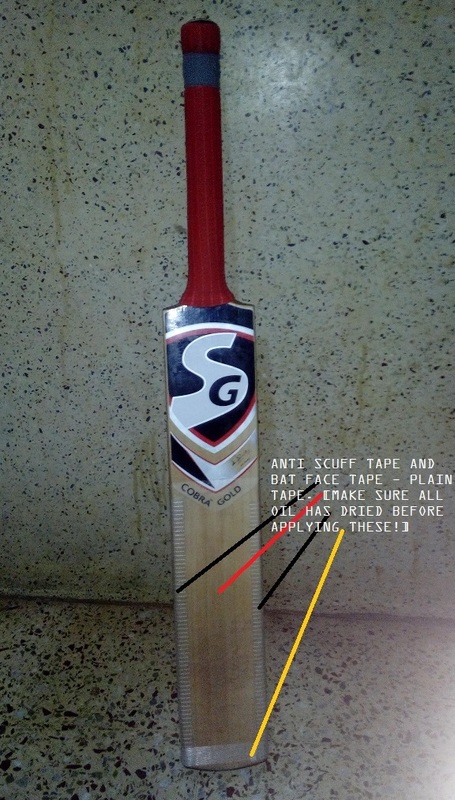 btw, for the cracked bat - i have applied medical tape and two layers of anti scuff tape - it will be back in action (since i had changed this to a team bat) from next weekend - have to make sure only 2 or 3 batsmen use this!